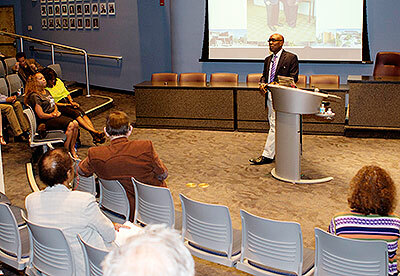 Dr. Reginald Oputa lecturing at his host institution, Pima Community College. The Fulbright Scholar-in-Residence (S-I-R) Program assists U.S. higher education institutions in expanding programs of academic exchange, by supporting non-U.S. scholars through grants for teaching at institutions that might not have a strong international component and/or serve minority audiences. Both the U.S. institution and the scholar grantee benefit from this experience. The S-I-R Program gives preference to the following types of U.S. colleges and universities. Institutions who may not fall under these classifications are still welcome to apply by partnering with these institutions. Your institution is invited to learn how S-I-R can help advance its international presence, assist in faculty and curriculum development, and diversify the educational experiences of its students, scholars and surrounding community. As an addition to this Fulbright Scholar-in-Residence (S-I-R) Program competition, we are seeking applications from U.S. colleges and universities interested in hosting S-I-Rs in the field of Cultural Heritage Protection and Preservation, with scholars/professionals specifically coming from Egypt. For additional information, please contact SIR@iie.org. A semester to full academic year. The focus of the S-I-R Program is to engage with institutions that are underrepresented within the Fulbright Program and/or serve minority audiences. Institutions who may not fall under these classifications are still welcome to apply by partnering with these institutions. Contact us to learn how the S-I-R Program can help your institution advance its international presence, assist in faculty and curriculum development, and diversify the educational experiences of its students, scholars and surrounding community. Last year, 35 institutions took advantage of the opportunities provided by the Fulbright Scholar-in-Residence Program to internationalize programs, develop curricula and faculty, and diversify student and faculty experiences. Your institution is invited to learn how it can take advantage of S-I-R benefits in 2019-2020. The Embark application system will allow you to enter, reenter and revise all sections of your application. Remember to periodically save any data you have entered. The Fulbright Scholar-in-Residence (S-I-R) Program is unique among the initiatives under the Fulbright Scholar Program because it is specifically-designed to help institutions, especially those underrepresented in the internationalization of higher education. Historically Black Colleges and Universities, Hispanic-serving institutions, Asian-American and Native American/Pacific Islander-Serving Institutions, American Indian and Alaskan Native Serving Institutions, Predominantly Black Institutions, community colleges and small and liberal-arts institutions, are primarily served by the S-I-R Program. Any institution in which a racial or ethnic minority makes up 50 percent or more of enrollment may also participate in S-I-R funding. A primary/priority institution with a fully-developed international program can also participate in the S-I-R program. But it must clearly demonstrate how the proposed Scholar will significantly enhance or expand an existing international program, serve students, help the campus and benefit the surrounding community. While institutions that have previously participated in the S-I-R Program are permitted to participate again, institutions that have not previously participated in the Program are encouraged to do so. The S-I-R Program also funds collaborations between U.S. institutions looking to host a scholar from outside the United States. Such joint ventures may include an underrepresented institution and a U.S. institution already engaged in some form of campus internationalization or a consortium of institutions looking to improve their global presence. The S-I-R Program provides a stipend of up to $3145 a month, along with travel expenses for the grantee and one accompanying dependent (based on grant length). A monthly allowance is also provided for accompanying dependents.. The S-I-R also receives modest settling-in and professional allowances. The participating institution(s) are encouraged to provide a salary supplement and assistance with professional expenses; housing or other in-kind remuneration can substitute for the salary supplement. The institution is also expected to provide the Scholar-in-Residence with professional development opportunities such as attendance at conferences within the scholar’s discipline. The Scholar-in-Residence often works across departments and curricula. This ranges from teaching undergraduate courses to advising on curriculum and faculty development. The institution gains from the expertise provided and the Scholar attains experience in U.S. higher education. The community, through the institution, provides the Visiting Scholar opportunities to participate in speaking engagement, community meetings and other grassroots activities. Through this, the institution can diversify the experiences of – and build goodwill among – the community. The S-I-R Program promotes cultural and intellectual diversity among the college and the wider community. Unlike any other program within Fulbright, S-I-R primarily focuses on the needs of institutions. It funds the lecturing work of Visiting Scholars in programs developed by such Historically Black Colleges as Lincoln University (PA) and Hispanic-serving institutions such as Texas A&M University-Kingsville. S-I-R also fund Visiting Scholars for lecturing at tribal colleges, community colleges, Asian-American and Native American/Pacific Islander-Serving Institutions - AANAPISI, American Indian and Alaskan Native Serving Institutions – AIANSIs, Tribal Colleges and Universities – TCUs, Predominantly Black Institutions – PBIs and small, liberal arts institutions. In addition to Minority serving Institutions (MSIs), the Program gives priority to community colleges, small liberal arts coleges, and rural colleges and universities. If your institution is not among these groups, it can still submit a proposal for funding. The S-I-R Program can help your institution leverage its financial, campus and community assets in a collaborative manner. This helps your school achieve short- and long-term goals and gives the Visiting Scholar you host the opportunity to develop their lecturing and communication skills. This approach also helps diversify the international experiences of your surrounding community. Thank you for your interest in S-I-R and the enriching opportunities it can provide for your institution, faculty, students and community. If you are interested in participating in S-I-R, there are some steps you will need to take in developing a proposal. It starts with developing the proposed program of activities that your institution would submit for S-I-R funding. The institution also must determine whether it has a outside of the United States in mind for S-I-R funding or assistance from U.S. Embassies or Fulbright Commissions abroad in recruiting one for the program. Either method is totally permissible. The proposed scholar should not have taught extensively in the United States within the past five years. In addition to classroom teaching responsibilities, involve the Visiting Scholar in campus and community activities. This may include participating in special lecturing series, speaking engagements before local community groups and K-12 schools or participating in campus and community organizations. There are no limits on the range of activities that can be listed in the proposal. The institution must also determine if the potential Scholar-in-Residence has the academic standing needed to teach the courses being proposed. This is a significant factor in determining S-I-R funding. The proposed Visiting Scholar must also have the English-language proficiency needed to conduct teaching. If the institution doesn’t have a faculty in mind, it can request help from CIES, who will work with Fulbright Commissions or U.S. Embassies abroad to recruit a potential Scholar-in-Residence. In order to facilitate the request, the proposal should list one or two countries in the same geographic region from where the institution wishes to have scholars, and provide a rationale for each country. Show how it will plan the activities of the scholar and oversee whether he or she successfully fulfills proposed activities. Describe the courses and/or seminars that the Visiting Scholar will teach. List the course title, hours that classes meet per week and anticipated enrollment. Incorporate the Visiting Scholar into faculty meetings and other activity. This ensures that the Scholar-in-Residence is facilitating faculty and institutional development, and allows for the development of their expertise and to more fully engane in the campus environment.. The institution should provide short-term (one-to-five year) and long-term plans for campus internationalization and explain how the S-I-R would contribute to those efforts. How will your institution sustain the benefits from your S-I-R after the scholar has returned home? Provide professional development opportunities for the Visiting Scholar. This includes participation in national conferens of professional organizations within their particular discipline. Involve the Visiting Scholar in campus and community activities. This may include participating in special lecturing series, talking with local media, speaking engagements before local community groups and visiting K-12 schools and school districts. . There are no limits on the range of activities that can be listed in the proposal. Your institution should then assess whether it has the institutional and community resources needed to develop the proposal and successfully gain S-I-R funding. Because of the S-I-R Program’s unique cost-sharing model, your institution is strongly encouraged to pay for all or part of the cost of hosting the Visiting Scholar. Although a salary supplement is generally provided, the institution can substitute that with housing or other in-kind remuneration. The institution should also work with community groups on developing activities for the proposed Visiting Scholar. This will help build goodwill with the community and help the Scholar-in-Residence gain the experience needed for his or her successful comparative lecturing and advising. A helpful list of tips for developing a successful application is available, as is the Guidelines for the S-I-R proposal. You can also contact S-I-R Program for additional guidance on developing your proposal. Note: Geographical listings in this publication are a matter of administrative convenience and are not intended to imply a United States government position on the legal status of the areas listed. A list of institutions who have participated in the S-I-R Program is available, along with case studies of successful participants among Historically Black Colleges, Hispanic-serving institutions, community colleges , other minority serving institutions and small, liberal arts institutions. The Fulbright S-I-R program is open to new applications for the 2019-2020 academic year. Review our Fulbright S-I-R Guidelines for a detailed outline of the sections of the application form and narrative proposal. Webinars are a great tool to learn about the program, discover tips and tricks for submitting a strong proposal and to hear stories from past hosts. Please see the webinar schedule under Resources. S-I-R program staff is happy to review draft proposals and answer any questions related to your proposal throughout the application season. Please send any draft proposals or questions to Kailey Smaczniak (sir@iie.org). Slate Application, Guidelines, Resources and more. CIES notifies applicant institutions of the review outcome. Department of State and the J. William Fulbright Foreign Scholarship Board review recommended proposals while Fulbright Commissions and Public Affairs Sections of US Embassies abroad recruit and/or review prospective scholars. “This program has resulted in an increased understanding of the importance of international education in our campus and the meaning/implication of campus internationalization. Faculty are inquiring about opportunities to expose their students to other cultures, and to teach abroad. They have approached the international office asking about specific programs and opportunities offered by Fulbright. Faculty and staff are learning about the benefits of international education and are also more supportive of our institutions’ internationalization efforts. Dr. Kaur has had a powerful and sustainable impact at MDC. For one, our curriculum was globalized and continues to be because of her efforts. While here, she provided a unique comparative analysis between Indian and American law, culture and experiences. Brooklyn College hosted a CIES-recruited scholar from Chile during the 2016-17 academic year. Chilean scholar Nicholas Lira taught in the Modern Languages Department and in the Anthropology Department. His research on Patagonia was well received and he was able to engage with scholars inside and outside his field. Aside from teaching commitments, he provided campus lectures and collaborated with the Anthropology and Sociology departments and scholars across the College and at the CUNY Graduate Center. California State University, Long Beach hosted Italian scholar Dr. Pasquale Palmieri during the 2014-2015 academic year. Dr. Palmieri lectured across four departments, teaching Government and Political Science in Western Europe in the Political Science department; The Building of the Italian Nation in the International Studies department; Early Modern Europe in the History department; and Dante in the Comparative World History department. In addition to his regular commitments, he gave an array of public lectures, guest-lectured in colleague’s classes, and invited international scholars to visit campus to speak. While at California State University, Long Beach, Dr. Palmieri was also able to visit and guest lecture at both the University of California, Los Angeles and the University of California, San Diego, and was an active participant in the Italian Cultural Institute of Los Angeles. Looking ahead, California State University, Long Beach plans to continue their collaboration with Dr. Palmieri engaging students and faculty alike. University of Hawaii at Manoa hosted Russian scholar Elena Sedova. Ms. Sedova taught third and fourth year Russian Language and Literature courses and participated in the work of the Russian Club. During the 2016-17 academic year, she participated in cultural events, club meetings, recruitment days, and the 29th Annual International Festival at Kapi’olani Community College. Ms. Sedova represented the college at two conferences dedicated to education and teaching methods. Her conference presentations included “Analyzing Ivan Bunin’s stories The Gentleman from San Francisco and Light Breathing in a Literature Class”, and one organized by the) and “Techniques for Teaching Literature in a University Class: a Personal Experience Using the Works of Ivan Bunin”. Abraham Baldwin Agricultural College hosted Mexican scholar Dr. Adrian Israel Martinez Franco during the 2017-2018 academic year. The scholar developed and taught ABAC’s first courses about Population Health Informatics and Health Information Technology to the nursing program and rural health program. These courses are critical pieces of Abraham Baldwin Agricultural College’s community health curriculum, according to Troy Spicer, the Dean of ABAC’s Nursing and Health Sciences. In addition to attending several meetings related to the University System of Georgia, Dr. Martinez Franco went to the American Medical Informatics Association Annual symposium in Washington DC. Middlesex Community College hosted Moroccan scholar Mohamed El Khaili during the 2017-2018 academic year. Mohamed taught Computer Applications, held office hours to work with students and took part in college services such as division and department meetings and other activities. Mohamed was very involved in campus and college activities spending several hours a day on campus. Dr. El Khaili successfully bridged the process of teaching at MCC and the teaching process of his home institution in Morocco. Pima Community College, hosted South African scholar Okobi Ekpo during the 2017-18 academic year. Dr Ekpo taught an Introductory Biology course, allowing PCC students from different health related majors to interact and learn from the scholar. This course assignment was consistent with his teaching experience and he led a course for students in their first year of college experience. Dr Ekpo participated in different College activities that increased mutual understanding between U.S. and other international countries. The activities included: Tea Time, Conversation with Honors students, International Education Week, Mexican Independence Day Opera Concert, Tucson Meet Yourself, and JADE Social Justice Retreat. The presence of Dr. Ekpo ignited the interest of faculty and staff to participate in teaching abroad and professional development. His residency resulted in an increased understanding of the importance of international education at PCC and the meaning/implication of campus internationalization. Faculty now inquire about opportunities to expose their students to other cultures and how to support PCC’s internationalization efforts. Bluefield State College hosted Liberian scholar Jackson Tamba during the 2017-18 academic year to teach advanced electrical engineering courses. Jackson engaged in two major extracurricular activities to sustain the institutional partnership between Bluefield State College and William V S Tubman University, his home university in Liberia. These activities included launching the campus chapter of Engineers Without Borders and recruiting BSC’s electrical engineering technology students to participate in a two-week study abroad program in summer 2018 to gauge Liberia’s challenges in electricity generation, storage, and distribution and whether hydroelectricity will help to resolve them. Their findings will be shared with Liberia’s energy ministry and Appalachian Power in West Virginia, the entity which funded Jackson’s housing costs during his Fulbright residency and which will provide BSC students travel costs to Liberia this summer. Huston-Tillotson (HT) University, hosted Chinese scholar Lan Luo during the 2016-17 academic year. Dr. Luo taught International Negotiations and Global Business Strategies at the School of Business and Technology. In addition to teaching commitments, Dr. Luo served as a member of the China Study Abroad Committee, International Festival Committee, and Asian Chamber of Commerce. “Dr. Lan Luo made an immediate impact on the institution.” Writes Dr. Edmond, Dean of the School of Business and Technology, “She was great in her role as management faculty and the students learned so much from her – not just academics but also about her culture.” Huston-Tillotson plans to collaborate further with this scholar to design and implement an articulation agreement with her school, Wuhan College in Wuhan, China, where students from her school would transfer to Huston-Tillotson University to complete their last two years of school. Tuskegee University host hosted scholar Ann Gallagher from the United Kingdom during the 2017-18 academic year. Dr. Gallagher’s time at Tuskegee University enhanced the National Center for Bioethics in Research and Health Care faculty, staff and students in understanding how ethics is practiced in England and other European countries. “Her interaction with students was empowering,” notes Rueben Warren, Professor of Bioethics and Director of the National Center Bioethics in Research and Health Care. The National Center for Bioethics in Research and Health Care faculty plan to continue collaboration with Dr. Gallagher in scholarly activities to include co-authoring several articles, developing a student exchange program and sending National Center for Bioethics in Research and Health Care faculty to a conference at Surrey University in 2019. Kean University host hosted scholar Shuangyu Xie from China during the 2016-17 academic year. The scholar taught two courses, Introduction to Environmental Science and Environmental Economics from a Global Perspective. In addition to teaching duties, the scholar actively participated in organizing events with the university’s Asian studies. including, Friday afternoon tea with Asian studies students, Mid-autumn festival celebration, Chinese New Year celebration. Shaungye Xie contributed to the Kean University community through participation in events on campus and in her community to increase awareness of the Chinese culture among US students and citizens. She participated in all guest speaker series and inter-departmental events and presented research with Kean University colleagues at various conferences with colleagues in our program to present her research. The scholar also initialized the development of a student exchange program between Kean University and her home institution. Miami Dade College host hosted Indian scholar Dr. Harpreet Kaur during the 2016-17 academic year. Dr. Kaur was a co-faculty member teaching paralegal and law courses within the college’s ABA-approved Paralegal Studies Department. As a result of her time at MDC, the college was able to provide a comparative analysis between Indian and American laws in the area of constitutional law, business law, corporate law, employment and human rights law. During her tenure, Dr Kaur also lectured about conducting business in India for the Business Department. She served as a Judge for a business plan competition for the Business Department and was a guest lecturer for the Honors College where she provided a riveting presentation on Women in India. Students gave her a standing ovation and sought Dr. Kaur as a guest lecturer for the student organizations, The Human Rights Club, Women’s club and Business Club. She also lectured for the Social Science Lecture Series at MDC. California State Polytechnic University, Pomona hosted Dr. Fatima Sadiqi in 2013-14, from Sidi Mohamed Ben Abdellah University in Morocco to teach Ethics and Women’s Studies and History in addition to working with faculty on curriculum development. Dr. Sadiqi’s presence helped Cal Poly Pomona students and faculty broaden their knowledge of North African and Arabic Studies. Dr. Patricia de Freitas, Professor Emerita said of the experience: “Dr. Sadiqi has given us her “insider’s” view of the religious, cultural and political complexities of the Middle Eastern and North Africa regions. This has generated an awareness of and desire on campus for greater understanding of the region.” Dr. Sadiqi was able to share her expertise in the surrounding community by building a greater understanding between Arab and North African world and the US. Nazareth College hosted Priyanka Borpujari from India during the 2016-2017 academic year. While at Nazareth College, the scholar taught Media and Human Rights” a course that focused on international issues, primarily having to do with India. She guest-lectured in multiple courses dealing with international issues, much having to do with human rights. She also gave a well-attended all-campus lecture on Home and Homelessness, which compared the ways this category is fleshed out in the U.S. and in India. Her work with the school for refugee students has also helped establish an important relationship for Nazareth in the future. These activities contributed to an enhancement in international understanding for U.S. citizens – particularly for Nazareth students who are largely first-generation college participants and their exposure to international, non-European influence has been limited. Regis College hosted Brazilian scholar Lania Stefanoni Ferreira during the 2016-2017 academic year. Dr. Ferreira taught courses in Sociology and Latin American History and contributed an international dimension by adding in the Brazilian perspective to the existing curriculum, and according to the college, vastly improving it. She helped Regis College fulfill goals of assessing and building academic course offerings in international /multicultural areas. Dr. Ferreira also participated in many international events on campus, especially in the Multi-Cultural Fair where her table was one of the most popular among students. She also participated in the weekly afternoon teas given for international students and by participating as a student in an English as a Second Language course at Regis, she met foreign students from a variety of countries. Her presence at these events and activities helped to increase student participation in international events on campus. Dr. Ferreira was invited to be a member of the subcommittee on Race, Ethnicity and Diaspora Studies. This subcommittee was tasked with proposing curriculum initiatives to enhance the major’s offerings in interdisciplinary courses that expand on issues related to topics such as the African diaspora, migration and immigration, displacement, among others. Dr. Ferreira provided the group with valuable ideas and resources that were integrated into the final curriculum plans. As a result of her stay, Regis students and faculty have an enhanced sensitivity to cultural differences. St. Francis University hosted Dr. Ruben Mamani of Bolivia during the 2016-2017 academic year. Dr. Mamani taught a module on air pollution control in an international context in the university’s Environmental Engineering Laboratory Measurements class. He also taught an entire course on climate change as part of the University’s general education program. Elements of both efforts are being retained for subsequent delivery to students by St. Francis University faculty. Dr. Mamani gave St. Francis students exposure to the culture and history of Bolivia via multiple routes. Perhaps most impactful, he gave an in-depth presentation at “Bolivia Night”, a fundraising and awareness-raising event held on campus in November 2016. My institution has limited resources. Will our proposal be accepted if we do not offer any salary supplement or in-kind support? My institution is not a Minority Serving Institution, Small Liberal Arts College or Community College. Are we eligible to apply for an S-I-R grant? My institution is a Minority Serving Institution that already has strong international ties. Are we eligible to apply for an S-I-R award? My institution enrolls a large proportion of minority students. Will we be given priority status under the S-I-R program? What U.S. institutions have participated in the Fulbright Scholar-in-Residence Program? Our institution is benefitting so much from the S-I-R currently on our campus. May we apply to host again? My institution does not have much experience writing and submitting proposals. Should we even consider submitting a proposal for a Fulbright S-IR award? Can an institution submit more than one Scholar-in-Residence proposal at the same time? Is preference given to proposals with named scholars? Our institution proposes to bring a scholar who is not in the humanities or social sciences. Is it appropriate for us to apply for an S-I-R award? Our institution seeks to bring a scholar to teach foreign language. Is it appropriate for us to apply for an S-I-R award? My institution would like to apply for an S-I-R award and name someone who was recently in the United States on a Fulbright Scholar award. Is this acceptable? My institution seeks to host someone who has limited English language skills. Is this acceptable? Our institution is interested in hosting a professional from another country, is this appropriate? What are the criteria for selecting institutions for the S-I-R award? What kind of outreach activities should we include in our proposal? Which is the most important goal of the program: to serve the institution or to serve the scholar? Financial contributions are evaluated on the basis of the institution’s capacity to contribute. Institutions are encouraged to think creatively about ways they can provide in-kind support. Some examples of in-kind support include housing, transportation, on campus meal tickets, apartment furnishing, professional allowances for scholars to attend conferences, etc. Please consult the S-I-R Program contact for more information. My institution is not a Minority Serving Institution, Small Liberal Arts College or Community College or Rural Institution. Are we eligible to apply for an S-I-R grant? Yes, all accredited U.S. institutions of higher education are eligible to apply to the program. However, the primary objective of the Scholar-in-Residence Program is to bring visiting scholars and professionals to minority serving institutions and/or to campuses that do not have a particularly strong international presence. Institutions not in the priority categories can enhance their chances by applying in partnership with a priority institution. Yes, the Fulbright Scholar-in-Residence competition does not exclude institutions with existing international programs or those that have other opportunities to host visiting scholars, but these types of institutions need to demonstrate clearly how the proposed S-I-R will significantly enhance or expand any existing international program, serve the students and the campus, and benefit surrounding community. Yes. In addition to giving priority to Historically Black Colleges and Universities (HBCUs), Predominantly Black Institutions (PBIs), Hispanic Serving Institutions (HSIs), American Indian and Alaska Native Serving Institution (AIANSIs) including Tribal Colleges and Universities (TCUs), Asian American and Native American/Pacific Islander-Serving Institutions (AANAPISIs), the S-I-R Program gives priority to other Minority Serving Institutions whose composite student enrollment is at least 50 percent racial and/or ethnic minority. A list of recent participants is available here. Immediate re-application to the program is discouraged. During the spring and summer months, IIE/CIES will conduct a series of 16 Webinars to assist colleges and universities in preparing successful Scholar-in-Residence proposals. IIE/CIES staff is also available to provide guidance and feedback on draft proposals that are submitted to IIE/CIES up to two weeks before the application deadline. The S-I-R program welcomes first-time applicants and encourages all applicants to discuss their proposals with the IIE/CIES Program Officer (contact information included at the beginning of the guidelines). Yes. However, only one proposal and one scholar will be funded. No. The Application Guidelines For Institutions state that it is not necessary to name a scholar and notes that most U.S. Embassies and Fulbright Commissions abroad are quite willing to recruit candidates. Yes. Proposals are typically funded in a broad range of fields and disciplines. Reviewers assess whether the subject/discipline is approached from a comparative or international perspective and whether the scholar’s activities have the potential to engage the entire campus. Institutions seeking purely scientific exchanges should not apply for the Scholar-in-Residence Program. All proposals must include a compelling argument for the impact of the S-I-R on the campus and community. Proposals requesting foreign language teaching must also have the Scholar-in-Residence teach about their home country’s, customs, culture and society. Preference is given to scholars who have not had opportunities to teach, study or conduct research in the United States for an extended period within the past five years. If you request a scholar with such recent experience in the United States, the proposal must give special justification (please check with IIE/CIES regarding questions about the eligibility of the scholar). The review committee may recommend the proposal on the condition that a different scholar be identified for the award. No, the scholar must be able to lecture in English. The scholar’s proficiency in English should allow him or her to successfully perform their collegiate teaching duties and speak at community events. Yes, provided the individual has the appropriate teaching experience. The S-I-R Guidelines encourage institutions to consider not only academics, but professionals in the media, government, the arts and from other fields. Professionals and artists have successfully participated in the S-I-R Program. There are two principal factors reviewers consider; (1) the benefits of the proposed program to the institution and (2) the quality of the program proposed, including: the academic and community outreach activities, plans for other campus activities, professional enrichment opportunities for the scholar and the sustainable impact of the S-I-R’s presence. Proposals that closely follow the Application Guidelines For Institutions tend to be the strongest and therefore more likely to be recommended for an S-I-R award. This section should indicate what educational, social and cultural organizations, activities and events in the community might be attractive to a Scholar-in-Residence. These should be resources where the scholar can learn from the community and where the community can learn from the scholar. Opportunities institutions can provide for their S-I-R’s professional development such as attendance of professional conferences, introductions to colleagues in the same discipline at other institutions, collaborative research projects with faculty members, access to research or other academic facilities, etc. Provide letters from civic, religious, professional and cultural community organizations, schools and school districts and other groups and organizations expressing an interest in hosting the S-I-R for substantive public speaking engagements and other outreach activities. Service to the institution is the most important goal. Other Fulbright Programs support scholars who are selected to pursue their own research and lecturing interests.